Luxury villa holiday rental. Yoga retreat venue. Cortona in Tuscany.. La Chimera. La Chimera (formerly Scopeto) is a 600 year old village fortress, recently restored and set in the heart of Tuscany. La Chimera sits on a number of stepped medieval terraces facing south on the side of a secluded valley, allowing all day sun and long bright summer evenings. The house is just inside the border that separates Tuscany from Umbria. This is a very special part of the province, benefiting from a more dramatic mountainous landscape than can be found elsewhere in Tuscany. The house is in its own grounds, and has an unobstructed 180 degree view of a sweeping valley, totally private and deliciously quiet. It is an ideal base for seeing the sights and sampling the delights of local markets and restaurants, historic architecture, olive oil, truffles, wines and cheeses. 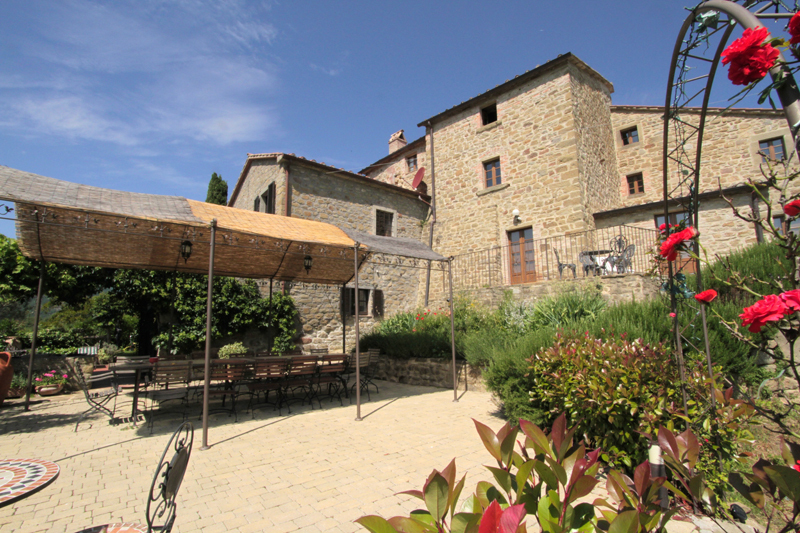 The house is the ideal venue for your yoga retreat in the heart of Tuscany. It is fully equipped with yoga mats, blocks, blankets, and beautiful yoga deck. We will pamper your guests and ensure they leave relaxed and rejuvenated. Terry and Michele, a film director and a yoga teacher/fashion designer, have lovingly restored this magical ancient house using local stone, Travertine, granite, mosaic and wood. 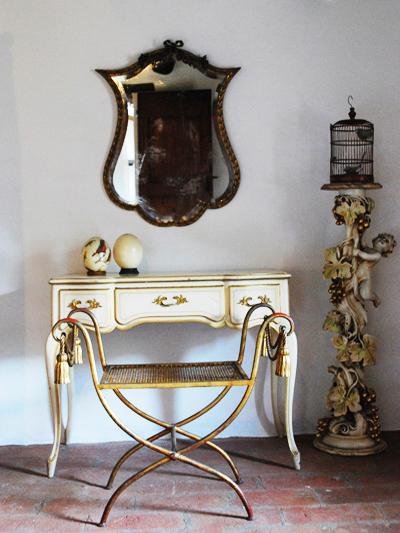 The house is fitted with all the comforts of home and decorated with a quirky mix of antiques, statues, beautiful claw foot baths, vintage fabrics and tiles. It also has a large wood yoga deck and more than 5 terraces to enjoy the spectacular view over the valley. Mod cons include a flat screen 50" TV, iPod dock, 3 ovens, dishwasher, and a beautiful pool. Rent the villa for your personal or family holiday. We have rave reviews! La Chimera has been finished to exceptionally high standards, with no expense spared to provide you with the best in comfort and luxury. Perhaps you want to escape to a peaceful haven away from the endless buzz of modern life, or maybe you are looking for a wonderfully secluded base from which to explore the magic of Tuscany and Umbria. 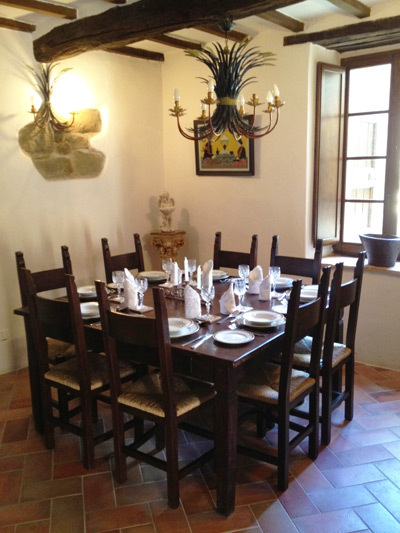 Whatever your requirements, La Chimera will surpass your expectations. Relax in a friendly home atmosphere with sunset meals on the terrace, meditation or yoga on the woodland yoga deck, or lounge by the pool.